Four portrait sessions. Choose from: maternity, newborn, 3, 6 or 9 month and 1 year with an optional cake smash. Specialty gift from Shine Photo at the end of the year – A beautiful 6×8 album of your favorite portraits after the final session. Baby’s First Year Session Collection Fee: $349.00 ( An $835.00 Value.) Payable prior to the initial session. One-time sessions are also available. Scroll down for more information. You’ve seen those amazing, popular baby pictures. The ones where baby is swaddled and wrapped, or propped and sleeping. The ones with the angelic faces using rustic props, baskets and tubs. These incredible infant poses are called ‘Miracle Shots’ and are best accomplished when baby is between 3 and 10 days old and are often the result of patience and careful planning rather than miracles. We’ll work with you to determine the best poses, props and colors for your photos at your consultation. Feel free to contact us if you have any questions! Choose a miracle image to have beautiful and creative composite wall-art piece made. Sizes start at 11×14 sizes and artwork can be added to any session’s product purchase. Just need one session instead of four? No problem. Most of the information on this page still applies. We offer Maternity, Newborn, 3, 6 or 9 month sessions and of course the 1 year session or Cake Smash. Various themes are available. Call us for individual session pricing. So You’re Expecting? How Wonderful! This is a very special time in your life that you’ll want to capture with portraiture forever. You’ll want to take advantage of our pre-session consultation so that we can plan for an unforgettable maternity portrait with lasting impact. It’s never too early to call us and start the planning. For your convenience we have a change room, washroom, baby change table and two makeup stations in the studio. Oh and did I mention the comfortable chairs? Coffee is always on for you too. We also have a 16 acre farm for outdoor portraits. 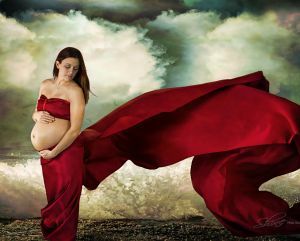 Modern maternity and portraiture is a relatively new field for both expectant moms and photographers. The digital era has allowed for photographers to work with parents in creating stunning images with multiple textures, creative accessories and in timeless colors schemes. Dads have also become an important part of the process, and many maternity sessions now include dad and mom posing alone or together. At Shine we’re happy to work with you to get you the images that you need, and that you’ll love for years to come. It all starts with a brief, pre-session consultation either by phone or in person over coffee to discuss the styling of your session. At the consultation we’ll determine what needs to be done in advance to make this a great experience for everyone. We’ll decide style, color and start working with you to determine what the final products will look like, including the complimentary album in the first year collection. It’s great to have some of the shots carry a theme from one session to the next. 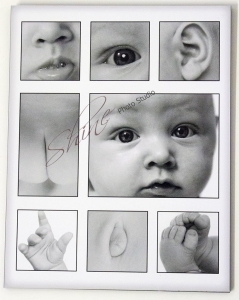 This allows you to create a cohesive wall display or baby’s first year book. By having all of the important info in advance, we can ensure that your final pictures are exactly what you wanted, and more importantly, what you love. Please arrive 15 minutes prior to your session start time. This will give you time to fix your makeup, hair and choose the clothing for your images. Clean and manicured finger and toenails look best. Nothing will ruin a shot like old, chipped, crackle polish. Babies need their nails groomed too! Yes, we do a lot of complimentary retouching, but we charge a fee to retouch things that could have been fixed in advance like wrinkled or pilled shirts and chipped polish. 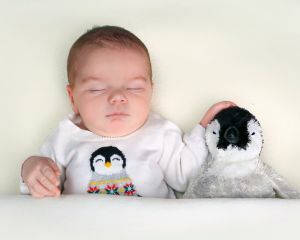 To schedule your Newborn Session we recommend that you call us two weeks prior to your due date. We will ‘pencil you in.’ After that, keep us posted as to the happy news. Newborns are best photographed between 3 and 10 days of age. This is when they are buttery flexible, and so tiny, that you won’t want to miss the images they create. You’ll never believe that they were THAT small once they start growing like weeds! In our pre-consultation we’ll discuss the props, themes, and accessories and any heirloom artwork that you may wish to add. Our studio will be really warm when baby arrives, so mom and dad should dress appropriately. Babies poop, pee, eat and sleep. And they cry. That’s OK! We are prepared! Leave the stress at home and enjoy the experience. We’ll take as much time as we need. This session goes by ‘baby’s time,’ not by the clock. Be sure to bring plenty of extra milk, diapers and baby wipes. This is a great session to include mom and dad for some artistic and family poses. You’ll be choosing one or more of these sessions for your Baby’s First Year Collection. Each of these sessions focuses on a milestone in your baby’s development. At three months, your baby may be lifting her head. SMILES start to appear. Say Cheese! At six months, your baby should be sitting on her own. You can also expect to see them laugh. At nine months, your baby will be crawling, and may even be standing with assistance. The first year session starts with the formal portrait, then moves to some fun props, and your carry-through theme. This is a great session to introduce siblings and mom and dad to the portraits again as well. Finally, if you’ve added a cake smash, we’ll put down the paper, bring out the cake, sing Happy Birthday. Then we’ll see what happens. Baby is left to enjoy the cake all by himself, or with the help of mom and dad. Sometimes mom and dad get into a food fight. It’s always a surprise and it’s always fun. You’ll need to bring a change of clothes for everyone to this session. A cake can be provided for you for a small fee or you can bring your own! 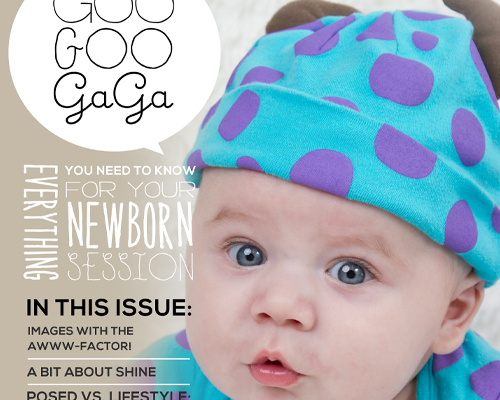 Our digital baby welcome magazine will be making an appearance here soon!